Want 10 Tips to Spice Up Your Company Meeting? Are you the planner of the monthly or periodic company or department meeting? They can be deadly dull if you're not careful. You know the drill. A bunch of talking heads line up to give people company information. Yes, it's definitely kudos to you for holding this periodic meeting. Employees need the information to align themselves with the company's strategic direction. They want to know what is happening across the company especially when the information touches their job or the company's overall success. They are sincerely interested in what is going on in the various departments. So, your employees are interested, but give them a break from the talking heads and unending powerpoints. The most effective meetings woo their attention with thought-provoking questions and answers, audio-visuals and participation. These tips will bring you success. Start your meetings, presentations and training sessions with an icebreaker or warm-up activity. In a large meeting or a short meeting, the icebreaker can be a single question that gets people thinking and talking with their neighbor. As an example, ask a question that causes people to raise their hands. The length of the ice-breaker depends on the length of your meeting, so plan wisely. Diversify your presentation methods. If every speaker talks to the audience, in lecture format, even interested heads soon nod. Ask people to talk in small groups. Use audio-visual materials such as videos, slides, and PowerPoint presentations and pictures. If you're talking about a new painting process, show your employees before and after painted parts. Pass around positive customer surveys and comment cards. Invite guest speakers for audience participation and excitement. Your customers have lots to say to your workforce about their needs and quality requirements. One client organization that partners with non-profit, charitable associations features guest speakers from the organizations that receive their donations. Speakers from organizations your employees support financially are dynamite. Encourage questions to get a dialogue going. Ask people to write down their questions in advance of the meeting and during the meeting. Allow time for questions directed to each speaker as you go. If you can't answer the question immediately and correctly, tell the people you'll get back with them when you have the correct answer. If questions exceed the time, schedule a meeting on the topic. An often-overlooked, but crucial, successful meeting tactic is to ask each speaker to repeat out loud every question he or she is asked. The person asking the question then knows the speaker understood the question. Other people attending the meeting can hear and know the question, too, not just surmise the question—perhaps incorrectly—from the speaker's response. Set goals for your periodic meeting. You can't present every aspect of the company's business at a one-hour meeting. So, decide the important, timely issues and spend the meeting time on them. Take into consideration the interests of the majority of the attendees as well. Remember, you have other methods for communicating company information that include such programs as Yammer, Google Hangouts, GoToMeeting, Skype for Business, Flowdock, email, and IM. The communication of all strategic company information does not have to take place at a meeting. Formulate your agenda carefully. Identify the needs and interests of the majority of the participants. Start with the good news that will make the attendees feel good. Vary the order of the speakers on the agenda each month. You don't want people bored with sameness. Distribute the necessary business items across the agenda so people don’t tune out the end of the meeting, or think the final items are less important. An article in the "Wall Street Journal," several years ago, stated that U.S. managers would save 80 percent of the time they waste in meetings if they did two things correctly. The first was always to have an agenda. The second was to start on time and end on time. I'll add that you need to allow each speaker the amount of time necessary to cover their topic. Hold them to their time limit—nicely. Organize the physical environment so that people are attentive to the meeting content. No one should sit behind or to the side of your speakers. Make sure that there are seats for all attendees, and if taking notes is required, a surface to write on, too. Make sure visuals are visible, and that people can hear. You may need to use a microphone. You can pass props or samples around the room for viewing. If your meeting size has become too large for the physical environment of your meeting room, use technology to stream the meeting in several additional conference room locations. 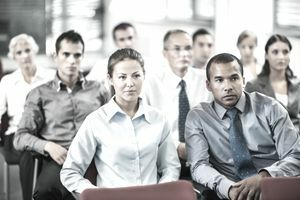 While you certainly could stream the meeting to the laptops of individuals, this negates the positive impact of team building that attendance with other employees in several conference room locations fosters. Never underestimate the power of food at a meeting. Food relaxes the atmosphere, helps make people feel comfortable, helps people sustain positive energy levels and builds the camaraderie of the team. Ensure you meet the diverse needs of your group with the food you serve. As an example, offer fruit and yogurt in addition to donuts. Offer vegetarian and kosher hot dogs with the regular franks. Need a Fun Lunch Ice Breaker?